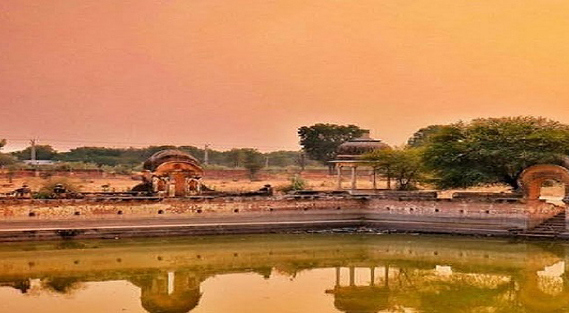 The region faced a terrible famine during 1956, Sethani ka johda is a water reservoir 3 km away from Ratangarh, it was built then by the widow of Bhagwan Das Bagla. Built as a research project, today the water in the reservoir attract a lot of birds and animals. You might even spot a neelgai. Salasar Dham or Salasar Balaji is a temple located in the small town of Salasar near Sujangarh in Churu district, Rajasthan. Dedicated to Balaji, another name for Hanuman, this temple attracts innumerable devotees throughout the year. Salasar Dham is in a religious circuit of centers of Khatu Shyamji temple and Rani Sati Dadiji (Jhunjhunu) temple and the Salasar Dham (or Balaji). All are located at a close proximity to each Other. The magnificent temple was constructed in the year 1754 and is now considered as a shakti sthal (place of power), a place where all wishes come true. The idol of Lord Hanuman here is deemed to be swayambhu (self-created). It is believed that on Shravan Shukla-Navami in 1811 Samrat, a farmer in village Asia found a unique idol of Hanuman with beard and moustaches while ploughing the field. The idol was then sent to Salasar, and a temple was constructed in 1754 AD by Mohandas Maharaj. On Chaitra Purnima and Ashvin Purnima, large fairs are organized and devotees from all over the country flock to the Dham to pay their homage to the deity. They parade to the temple barefooted, to prove the intensity of their devotion or to complete some mannat (wishes). Spread across 719 hectares, Talchappar was declared a reserved land in 1962. Talchappar has a unique ecosystem, with mostly grass covering the land, it falls on the way of many migratory birds who while flying back to their home, stay on for a while or for an entire season. This place is popular amongst bird lovers. It also homes the rare and endangered black buck, jungle cat, rojra, foxes etc.